The scent of the day is Q, Quercus agrifolia, devoted to the Coastal Live Oak. I started my fragrance line with this botanical perfume. The intention connected with Q is to bring awareness to the native Oaks of California. This path was revealed when a contractor bought the empty lot next to us to build a huge McMansion. 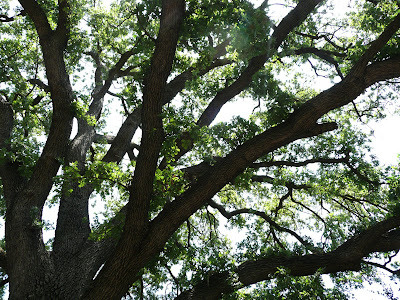 We organized our neighborhood to protect the Oaks and the development of the lot. To my regret, the contractor that we have been wrestling with has come back from the dead. Although the bank foreclosed on his other project, like a horror film, he has returned. We received the letter from the city informing us that another hearing has been set. Good grief, here we go yet again! I'm feeling quite distraught at the moment. Intending that in the morrow the feisty self will be back, ready to once again organize the neighbors to defend oaks and land. I am calling forth Soverieignty, the Celtic Goddess of the land, to help us. According to the book The Celtic Way of Seeing: "Sovereignty holds the the axis mundi. She is the one who bestows "rulership" to those who are in right relationship with her. "1 Thus, please anoint yourselves with Q and appeal to Sovereignty for her assistance. I took the photo at top on Monday while hiking in Malibu State Park. It is a gigantic Quercus lobata we came across on our adventure through the woods. 1. The Celtic Way of Seeing by Frank MacEowen, page 52. From the Point of Creation here on the Big Island, I, Ninkhursag, Lady of the Mountain, lover of the Oaks, friend of Roxana and all the treasure trees whose roots connect us all to our truest selves, intend that these oaks sing loud, sing sweet, sing wild their tales of sheltering sky and land. I intend that all who hear the gently offered words from Roxana and Greg who speak the truth of their legacy hold only the vision of their boughs stretching toward the future with the greatest of health and joy. I further intend the steward of the land wakes up to his greatest and highest good being a caretaker of this precious property of which he has learned already many lessons of his humaness and that he refocuses his vision only on collective good and abundant love for all beings, whether they have legs or spiraling roots in the soil. I intend that all hearts focusing on the oaks further refine their focus only on the good, the pure, the love, the health and joy that is available when we circle like beautiful branches and that any words of protection will only be with the violet ray of transmutation gently holding all to their perfection. If this is for the highest and best good, then so be it. And so it is. It is done, it is done, it is done. Blessed BE! Jane, my dear friend, how lovely to experience your beautiful spirit through these words you have written. This poetry is filled with the essence of YOU and all that magic that you shine with. A wild aloha blessing indeed! Thank you so very, very much.